After the colonial-revival garden behind the Longfellow House was rehabilitated and its pergola restored, the Friends established a fund for future maintenance of that public resource. The Friends named the fund after Frances and William Ackerly, who had both contributed so much to the garden and to the Friends in general. The photograph at right shows Frances and Bill on the day when the House staff and Friends surprised them with this honor. Frances was a founding board member who took on many tasks, from maintaining the membership list to speaking to elected officials about the site’s needs. Bill and Frances both helped to raise funds for the garden, and enjoyed many events at Longfellow House–Washington’s Headquarters. 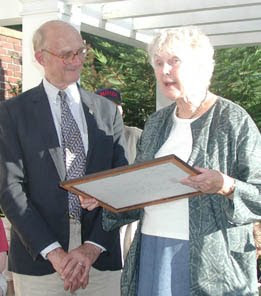 Frances died in March 2011, having named the Friends of the Longfellow House as one of the charities for memorial gifts. We are proud to direct those donations to the Ackerly Garden Maintenance Fund, and thus to the future of the garden for all visitors. Please donate the amount of your choice to the Ackerly Garden Maintenance Fund.